The title of the report, as it now appears, is “Glencore traded with Iranian supplier to nuclear programme”. 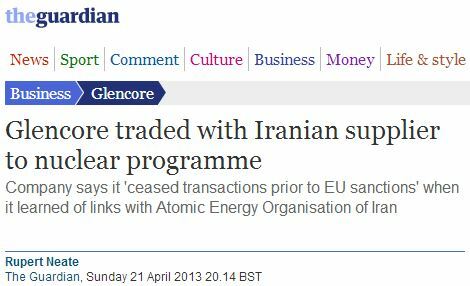 However, the if you go back in time a few days (to a cached page), you can see the title they originally used: “Glencore traded with Iranian supplier to nuclear weapons’s programme”. At some point after the story was published on April 21 the word “weapons” was deleted from title. Whilst we’ll likely never know for sure what prompted the Guardian “correction” to the evidently counter-revolutionary suggestion that Iran is working on a nuclear weapons program, the paper’s history in denying the obvious about the regime’s nuclear ambitions provides some context. Iran had carried out tests relevant to the development of a nuclear device. But the award for great achievements in ideologically driven propaganda goes to their former veteran journalist Brian Whitaker, who actually served as the Guardian’s Middle East editor for seven years. In a ‘CiF’ piece in Nov. 2011 titled “Why do the US media believe the worse about Iran?”, Whitaker not only ignored IAEA reports but suggested that the clandestine Iranian program may not even be a military program at all, but merely a ‘peaceful civilian project’ to manufacture nanodiamonds. 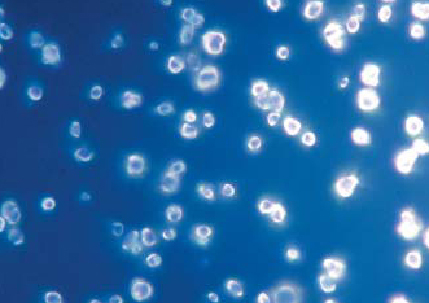 Nanodiamonds – a substance used in polishing compositions, coatings, lubricants and polymers. Though the question of whether or not the Islamist regime in Iran will be able to successfully carry out their mission to develop nuclear weapons depends on the resolve of Western political and opinion leaders to stand up to the threat, the Mullahs in Tehran can always count on the Guardian Left to run interference on their clear aspirations to regional hegemony. So what has happened at the Guardian is not as unusual as some make it out to be. Injustice has been recognized and attempts are made correct.. In 1941, Britain was an imperial power dedicated to the European experience of colonialism even though at the time the system of colonialism was breaking down many in Britain, particularly the Liberals consider colonialism their civilizing mission. Today that myth has been debunked. Racism is being defeated and the myth of the civilized West against the barbarians in the East is debunked. Guardian, among many others, is only expressing that process. Ashley you are showing your complete idiocy again. How do you connect a blatant lie published by the Guardian to racism, colonialism, disgraced pseudo scholars, and an MP who by the way is an unashamed thief of public money and a well known anti-semite? You must be suffering from the same mental problem what Kaufmann used to explain off his moral insanity – OCD. (Go look it up on Wiki). In your case I would call it BDS (Broken Disc Syndrome). And all this time I thought “ashley” was male. Thanks for setting me straight. Peter- your unmasking of this person brings up an interesting question- should reasonable people respond to or engage with these haters, or just ignore them? In her case, I choose to ignore her. Debating a bigot is like wrestling a pig. You end up getting dirty and the pig loves it. When did Gerald Kaufman turn into a Zionist? cba really you must read more widely – broaden your mind – never know one day you like the Guardian and kaufman would realize the error of your ways – mind you with a name like cba – I doubt it. Dirty little thing, isn’t she. Anna Marie? Yeah, she can’t help herself. Now I know were people learn to compare Hamas members in Gaza to the Jewish resistance during World War II. He was also,according to him ,a friend with Arafat which can explain a lot about this self hating Jew.